Down the road from our office is a stage props company. Over the last year I've seen some interesting and creative pieces in the loading area but recently, some of it spilled into the street. 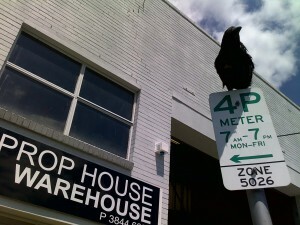 The first time I saw the crow sitting on the parking sign, I initially mistook it for the real thing. It was only on second glance that I realised it was one of the props. I'm a big fan of things that make you not only look twice, but make you stop and think.